Welcome to GOLD FEVER! The Lure and Legacy of the California Gold Rush. 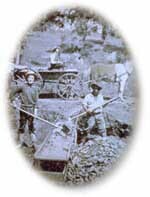 This site, and the museum exhibition it previews, commemorate the 150th anniversary of the discovery of gold at Sutter's Mill on January 24, 1848, and the frenzied rush to California of gold seekers from around the world. This restless tide of diverse humanity invaded California seeking to change their lives and fortunes. What they and those who were already here experienced ran the gamut from staggering success to unmitigated disaster. What happened here in those few short years of the Gold Rush changed not only the lives of those caught up in the rush but the very nature of California itself  and the nation it had so recently joined. But the story does not end as the gold fever raged and ebbed. The forces unleashed by the gold rush reverberated for decades, forging a new California of immense complexity and diversity. You can experience a preview of all this yourself by following along on a virtual journey through the exhibition. Walk in the footsteps of those who were there. Hear their words and their stories. See what they made and used and did. Take time to explore and discover along the way. But you'd better get going. See you in California.